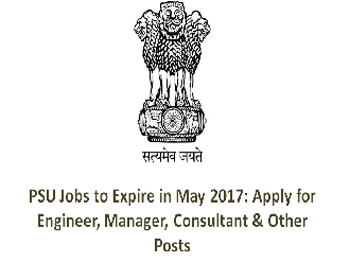 Engineers, Managers, Consultant and some other job posts will be filled up under various PSUs. BEL, RITES, IOCL, NCL, ONGC are some of the eminent PSUs that have issued notification to fill up various posts. Job aspirants need to gear up to apply for PSU Jobs that will expire in May 2017. A total of 300+ job posts are still active for willing candidates to apply under various PSUs. Engineers, Managers, Consultant and some other job posts will be filled up under various PSUs. BEL, RITES, IOCL, NCL, ONGC are some of the eminent PSUs that have issued notification to fill up the posts stated above. The jobs will be expiring in a week or two and so candidates should apply soon for the posts they are eligible and applicable for. For all the job posts, graduation degree in a must along with a specific age limit. The major job vacancy of PSU is issued by NCL to fill up 129 Exe Engineer and other Posts. The last date to apply for this post is 30 May 2017. The other important job vacancy is by CPCL to hire 56 Engineering Assistant and Other Posts. Application process will end on 31 May 2017. Candidates need to check other details through the official links that are given below.